The Queen's 90th Birthday: A Service of Celebration for Commonwealth Day (BBC1, 2.45pm) Live coverage of the service from Westminster Abbey, marking Commonwealth Day. Behind Closed Doors (BBC1, 9pm) Documentary following the Thames Valley Police's domestic abuse teams over a year. First Dates (Channel 4, 9pm) Series 6 of the show where people go on first dates, watched by hidden cameras. The Estate We're In (BBC1, 10.45pm) Documentary following the lives of council tenants and homeowners in the West Hendon estate of Barnet over a year. ★ Horizon: The Immortalist (BBC2, 8pm) Science special about Russian millionaire Dmitry Itskov, who plans to upload his mind to a computer before his death. Brendan O'Carroll: My Family at War (BBC2, 9pm) Documentary where the writer and comedian tells the story of the Irish Easter Rising, where 1600 rebels took over the centre of Dublin in 1916. Jo Brand's Hell of a Walk for Sport Relief (BBC1, 9pm) Coverage of the comedian's charity challenge, as she walks 135-miles from the east to west coast of England in 7-days. Speed with Guy Martin: F1 Special (Channel 4, 9pm) Motoring special where Guy Martin races David Coulthard in a bike vs. car challenge. Sport Relief 2016 (BBC1, 7pm) Annual charity telethon, hosted by Gary Lineker, Davina McCall, Claudia Winkleman, Greg James & Alesha Dixon. Featuring David Walliams, Andrew Flintoff, Peter Crouch, Micky Flanagan, Jo Brand, Michael Crawford reprising Frank Spencer with Bradley Wiggins, Eddie Izzard, Idris Elba & The Great British Bake Off. 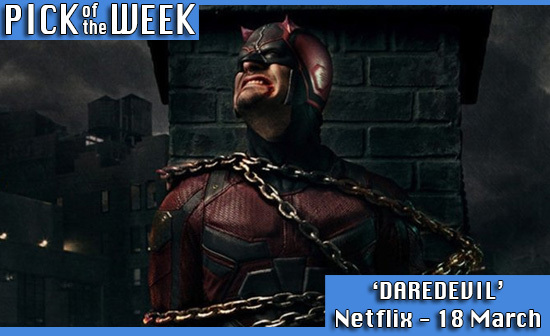 ★ Daredevil (Netflix) Season 2 of the U.S superhero drama. Starring Charlie Cox, Jon Bernthal, Elodie Yung, Deborah Ann Woll & Elden Henson. Gareth Malone's Great Choir Reunion (BBC2, 7pm) Special to celebrate the 10th anniversary of The Choir, where Gareth Malone tracks down ex-choir members to sing together at a reunion party.